A unique mix of bold creativity with strategic vision and thorough insightfulness, Manuela is what we call today an ideas person. She cultivated her skills over the last 9 years spent in our group and refined her multidisciplinary vision in creative & strategic think tanks in Berlin, Belgrade, Cannes and London. With her most important asset coming from the complexity of her perspective, Manuela is an ideas catalyst and a visionary integrator having been engine in many of the creative platforms developed in our group of companies: from PR to ATL, from brand to corporate communications, from BTL to digital and social media campaigns. Beck’s, Bucegi, Colgate-Palmolive, Coca-Cola, Ferrero, GSK, Johnson&Johnson, L’Oreal, Mercedes-Benz, Orange,The Romanian Red Cross, The European Parliament, Staropramen, Stella Artois, Tuborg, Unilever, ZIZIN are just a few of the brands she created for, signing memorable ideas that turned into best practice cases. 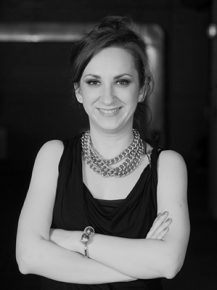 Manuela contributed to winning over 40 awards at local and international communication festivals, among which: ADC RO, Effie, IPRA Awards, Romanian PR Award, Sabre Awards, Webstock. Copyright © MullenLowe Romania 2019.